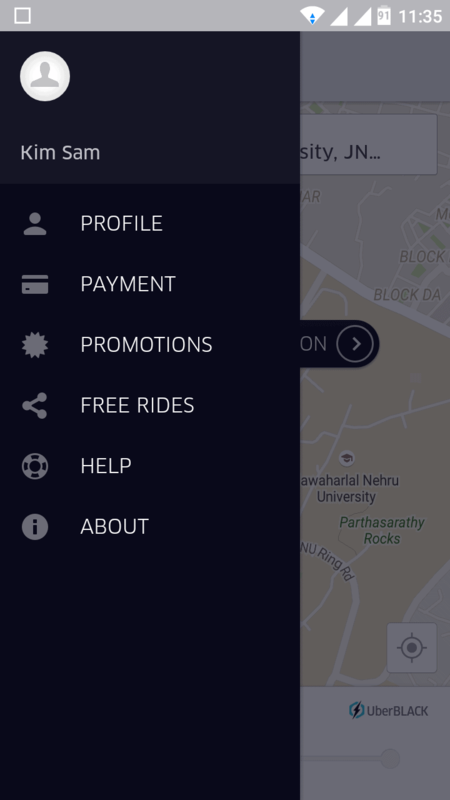 I have been using Uber taxi for more than a few months now and in this post I am going to share my experience with it. Before starting to use Uber I have also used Meru Cabs and Ola Cabs. I also gave a try to TaxiForSure but their app never showed any taxies available so I never got a chance to actually use it (Now TaxiForSure has been acquired by Ola Cabs). The basic working model of all these taxi calling apps is almost same. They connect you to a taxi available nearest to the place you are at. These apps are GPS enabled so they detect your location and send it to all the available cabs in your vicinity. Now the first cab driver to accept the pickup gets it and his contact details with vehicle details will be sent to you. The driver will get your location on his device, so you don’t need to explain your location (though I have had different experiences sometimes which I’ll come to later). The driver reaches your place, you board the cab and he will click the ‘start ride’ button’. Now when you reach the destination the fair will be displayed and you can pay either by cash or you can connect some e-wallet like Paytm or Airtel Money. What makes Uber different than Meru, Ola and other services is its professionalism. Uber’s cabs are generally cleaner and well maintained than others. With Ola many times I got dirty Eecos and Omnis, with faulty ACs, which looked more like kidnapping cabs. 😉 Moreover I have found that Uber drivers are generally more professional and polite. I think drivers of all cabs are basically same, its just that Uber trains them well and have proper incentives for positive customer reviews as well as penalties for negative ones. I , myself, send critical feedback about driver’s impolite behaviour and rash driving and Uber immediately apologised and assured me of action. Once they refunded 50% of the fare as a token of apology because the driver had no idea of the route and I got late for a meeting. With Ola and Meru, I have got headache many times explaining them the location and route as the drivers are not well trained with the GPS technology. And last but not the least that Uber is the cheapest of all the cab services. The auto fare in Delhi is Rs. 8 per km. and the Uber fare is Rs. 7 Rs. 6 per km. You can go to this link to get a fare estimate for your next trip in Delhi. 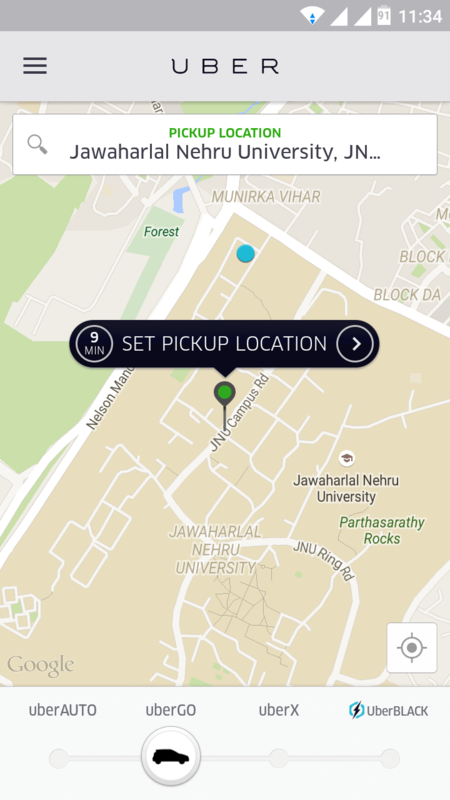 You can install Uber app on any android or iOS device. First you will have to sign up with your phone number and add a payment method. You can add any debit or credit card but I would personally recommend using Paytm wallet as it is really convenient and safe. When you launch the Uber app it gives you the option to choose your pickup location and the type of car (smaller cars are cheaper). It shows you the cars available nearby and shows ETA (Estimated Arrival time). After the taxi picks you up and the driver starts the trip on his phone The Uber up will show you the shortest route to the destination all the time with exact location of the vehicle. If you want you can also share your location updates to any friend or family member, so that they know the location of your cab all the time and be assured that your vehicle is on the right route. They will also have all the details of the taxi and the driver. This feature is good specially for women and children. After reaching the destination the driver will end the trip and you will get the details of fare through sms and mail. 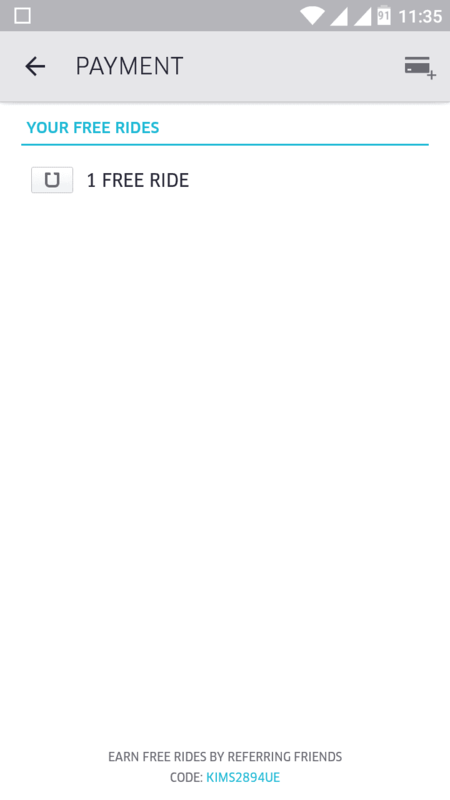 You can also give your rating to the driver driver through the app. The ratings affect how much the driver earn. So they behave well with the customers. If you think that the fare that you were charged was unfair you can request for a review and they will correct you. From my personal experience I can say that Uber customer support is really excellent. In more than 4 trips I was charged a Toll fee when going from Delhi to Noida even when I went through a route which has no tolls. Later I requested them to check it and they always corrected the fare and processed the refund in less than 10 minutes. These small good gestures generate big trust. 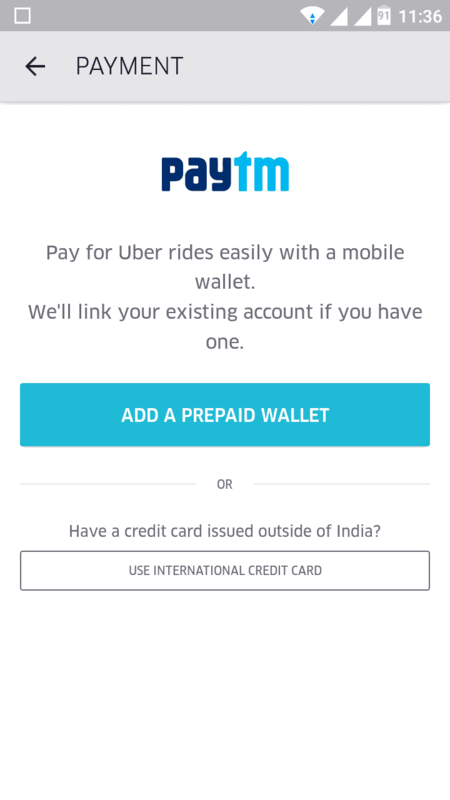 Note : You need to have a minimum balance of Rs.200 in your Paytm account (or you need to add a card) to get the Free ride. Download the app. Sign in and Go to the Menu and select payment. Click the Card + sign on right hand corner. Add Paytm account and recharge with 200 or just add a card. BOOKING UBER RIDES.IM FIXING THESE ERROR FOR FOREVER ” “There was an error processing your request. if this continues please reach out – [email protected]“. ALSO FIXING ALL ERRORS THAT DO COME. IM SELLING COMPLETE TRICKS OF UBER ,1MIN BOOKING TRICK,OTP BYPASS,ALL TYPES OF UNLIMITED TRICK . Highly energetic blog, I liked that a lot cabs blog. Will there be a part 2? Ladkiyo k liye bilkul bi thik nhi Hai Uber . Khas Kar Uday veer ho to bilkul nhi krne chiye. 1 passenger ki jga or bi passenger uthta Hai . Next time kbi book nhi kruga Uber cab.